At the end of a long, exhausting day it was finally time for Sony to show off their goods. They started by plying all the journalists with food and drink, something much appreciated after a long day of conferences. But we were there for the news, and they certainly had loads to say. PlayStation started things with a big bang – Destiny. Showing off some beautiful new visuals. Destiny will go into Beta 17 July, but wait, there’s more. Starting on Thursday, PS4 owners will be able to play the Alpha first look. 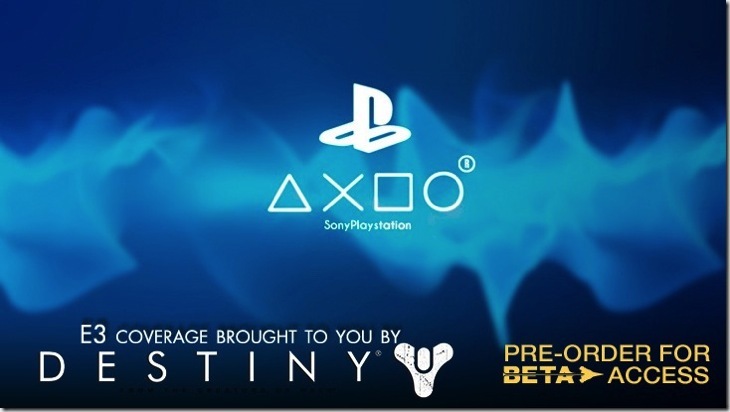 Plus, gamers can grab a Destiny PS4 bundle later this year, including a white console. Next up was some very eery and creepy video of The Order 1886. We got a sense of gameplay, as well as how gorgeous that game will be. I’m excited for it, but I’m also terrified by it – perhaps that’s a good thing. Next came a colourful and quirky game, Entwined. It’s a new take on a dual-stick game and is available now. Infamous: Second Son will be getting a standalone DLC (you can grab it without even owning the original game) that gives us insight into Fetch’s story. Little Big Planet 3 was next, garnering some big big applause from the audience. We were treated to a live demo (including some failed jumps and random accidental killings). From Software’s new IP: Bloodborne was next and it looks absolutely terrifying. Presumably this is the Project Beast that we’ve been seeing in leaks, and it made me more than a little afraid. Next up was even more Far Cry 4 – that game is shaping up to offer some amazing visuals and gameplay. Killer elephants that can destroy all the things? Sign me up! I enjoyed the next part, a funny and silly trailer for Dead Island 2. It was followed by more zombie infected news – The Last of Us is getting integrated in Diablo III’s Ultimate Evil Edition with some custom enemies and special attacks. Battlefield Hardline was next, but the fact that Disney Infinity 2 will have special features for the PS4 was honestly more interesting. The only place you’ll be able to Hulk Smash is on the PS4 (so they say). Next up were some more off the wall titles. Magicka 2 is coming, as is a Grim Fandango remaster. Devolver games showed off a bunch of indies, primarily featuring Broforce and making us ridiculously happy. Let it Die is the new game from Suda 51 while ABZU is from the makers of Journey and will show more aesthetically inspiring content. No Man’s Sky was then shown off in all its glory. This was another title that hadn’t really done it for me, until I saw it at the Sony press briefing. Now I think I’ll need to get my paws on it. Time for a lull in the conference during which Sony went on for far too long talking about the PSN and new hardware. Sure, I’m keen to see more about Morpheus, but not in this setting. Waking us from our slumber was the glory that is Mortal Kombat X. This time, the game showed off actual in-game content and looked incredible. I can’t wait to get my fatalities on. Oh look, another lull in the conference as Sony spends far too long talking about the original programming coming to PlayStation. TV! Two remasters are on their way: Ratchet and Clank and The Last of Us. Next we saw the new trailer for MGS: The Phantom Pain, which is also what they call it when amputees still feel pain in their missing limbs. GTA V is coming to PS4 in the fall (Northern Hemisphere) of this year. But way more exciting, especially for Darryn, Batman time! The new trailer showed off so much, it is truly a sight to behold. I will definitely need to play this iteration – it is too beautiful to pass up. With only one game left to reveal, the hall was abuzz, waiting for news of The Last Guardian or perhaps a JRPG. But no, it was more love for Naughty Dog as we got some Uncharted 4. Next article Who “won” and who “lost” E3?